Our adjustable automotive mount bracket converts your device into a hands-free mobile navigational tool. Mounts unit securely to glass windshieldsÂ¹ and detaches in seconds. 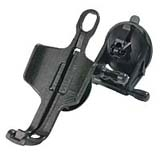 Includes automotive windshield mounting bracket, suction cup and installation instructions.